The Sole F85 Treadmill is On Sale! The Sole F85 treadmill may just be the best folding treadmill for runners. It has a powerful motor, extra long running surface, and an impressive warranty. This newest version now has Bluetooth capability so you can track your fitness stats using a free Sole Fitness app. Sole has the reputation for building quality machines at value prices. They back it up with an industry leading two-year service warranty. Sole treadmills are used by the Hilton Hotel chain for in-room fitness. With a proven track record in a rigorous commercial environment, you can expect the F85 to hold up exceptionally well under residential use. The Sole F85 is priced at $1,999.99 with free shipping. A “Best Buy” treadmill for runners! Note: Also see the non-folding Sole S77 version of the F85 for $100 less. Bluetooth Capability – This upgraded model now has Bluetooth capability so you that you can transfer your workout stats from your machine to your smart device. A free app from Sole is available or you can use another compatible program. 22″ x 60″ Treadbelt – The length is ideal for both jogger and runners, and for individuals with long strides. You won’t feel like you are about to fall of the end. This extra wide 22″ tread belt is usually found only on commercial grade models. We were told that since they added this feature, sales have soared. 4.0 Continuous Duty HP motor – A 4.0 HP motor is like having an 8-cylinder hemi under the hood. It will run effortlessly at high speeds. This size motor is about as powerful as it gets for home use. Extra Large 2.75″ Crowned Rollers – Few people realize the value of large rollers. The larger roller surface means less revolutions, which translates into less wear and tear on the treadbelt, rollers, bearings and the motor. The larger rollers will also reduce the noise level. Being ‘crowned,’ the roller is slightly bigger in the center. This allows the belt to track better, reducing the need for adjustments and further increasing the longevity of the belt. Speed and Incline Controls on Handlebars – As runners, this is a feature we particularly like. You can change up the speed and incline without having to lean over the console, which often causes breaks in your stride. Premium Console and 10.1 TFT LCD Display – The console has a smart layout. Displays include Speed, Incline, Time, Distance Traveled, Calories, Pulse and Pace. There is also a 1/4 mile track feature and a peak / valley graph. In addition, there are speakers with inputs for MP3 and iPod players, and a cooling fan. Note: The fans give moderate relief and don’t expect Bose quality from the speakers. Impressive Warranty – This machine comes with a lifetime warranty on the frame, motor, and deck, 5-years on parts and electronics, and 2-years on labor. The 2-years labor coverage is exceptional. When we talk to other manufacturers and mention the Sole warranty, they shake their head and wonder how they can manage the expense. Well Duhhh! There is no expense if the treadmills are low maintenance. Wireless Heart Rate Control – If you are serious about getting the optimum workout, then HRC is an attractive feature. Many professional athletes use HRC to maximize their workouts. 301 Lbs. Weight – The Sole F85 treadmill weighs as much as many commercial models. This means you get a very stable and solid feel, even though it is a folding treadmill. Note: You don’t want to have to move this machine. If you order direct from Sole, the Free Shipping is to the curb. You may want to opt for the inside delivery option. Also, be aware that due to the size and weight, when folded, this treadmill is not as compact as some budget models. We feel this is one of the best folding treadmills available. It is built for commercial use, so it will excel in a home environment. You can’t beat the 2-years service warranty. No one offers two years coverage for in-home labor in this price range. That, alone, tells you that you are purchasing quality. When we ran on the Sole F85 it was quiet, stable and had just the right amount of shock absorption. The salesperson mentioned that this machine, along with the other Sole treadmills, blew away the competition for quality. 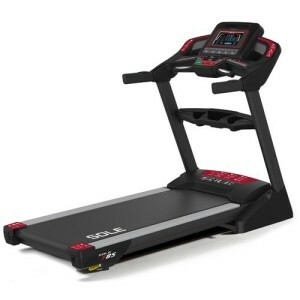 As a side note, if you do not need a folding treadmill, then you can get the Sole S77 for around $100 less. Overall, the F85 is a very durable machine with an excellent service record. We have yet to receive any negative feedback on this treadmill’s performance. The Bluetooth workout tracking is a great addition to an already fantastic machine. Great Treadmills For Runners – The Sole F85 is a great value for money treadmill for serious runners. I clock over 25 miles per week and it has held up well for 3 months now. I am using it to train for my first marathon. I like the long belt and the 3.5HP for this price is a steal as compared to other treadmills with similar features. Made For Runners – My wife and I have been running and walking on this machine for over a year and a half and we’ve had no problems. The heart rate monitors could be better but I’m not convinced any of the treadmills offer anything more accurate. They get you in the ballpark. The warranty is what really matters and few machines match Sole’s much less alone exceed it. I’ve spoken with Sole on several occasions and the customer support is superb. No overseas call center and instant response from a company that wants your business. I found several annoying things: 1)the heart rate monitors are positioned so that , at 5’9″, I had to stoop slightly to hold onto the sensors. It took about 1-2 minutes to register a pulse that even approached accuracy, making the monitor essentially useless as it was so uncomfortable walking in a bent-over position. 2) the plastic cover at the front of the tread extends too far back; I regularly found my feet hitting it. 3) It doesn’t fold to a complete vertical position like my previous treadmill and takes up more space in that position. 4) There appears to be speakers on the console, a plug for headphones and another with a music-note symbol on it. I guess I’m supposed to somehow plug an audio device in that hole, but can;t fathom how because a)the plug is the wrong type for connecting either an mp3 player or any other kind of audio device that I know of, and b)the instruction manual doesn’t even mention this feature. Go to wwww.SoleTreadmills.com to learn more. Motor: 4.0 HP Continuous Duty, ultra high torque – Can handle serious runners. Incline: 15% maximum, rack and pinion gear design. Most treadmills only go up to 12%. Weighs a hefty 280 lbs., giving it a very solid and stable feel. Rollers: 2 3/4″ – Designed to extend the life to the belt, motor, bearings and rollers. Folding with the Easy Assist folding feature. Heart Rate Control with wireless chest strap included. Hand Pulse Grips for easy readout of your heart rate. Arm rest speed/incline controls, makes it easy for adjusting. this Sole F85 Treadmill Review is based on not only testing the equipment, but also comments, testimonials, reviews and ratings of customers and third parties. In addition to visiting the corporate offices and talking to company officials. We attempt to be as accurate as possible. Warranties, features and prices can change without notice. I will not be using the machine on the curb so if you can not wheel it into the house I will look elsewhere. I believe Sole offers in home delivery, and set up option at check out on their website.